Based on the eponymous work by Graciliano, Nelson Pereira dos Santos brings to the screen a story of liberation of body and soul through the metaphor of the prison. The prison here is our Brazilian society, full of concepts and preconceptions imported heir of colonialism, with its rancid subdesenvolvimentista, eternal dependent hostage of any metropolis. The release, in turn, is not only physical. Not only is it able to escape the prison, but mainly to get free the soul prejudices, social and economic pitfalls, the invisible chain that makes us prisoners every day. 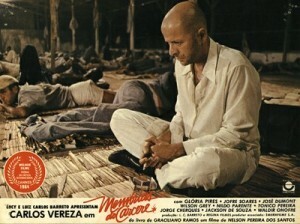 In the book, like the film, Graciliano account a period of his life, when in 1936, at which time he held the position of Director of Instruction of the State of Alagoas, was arrested on suspicion of participation in the National Liberation Alliance (grouping different left tendencies opposed to the government of Getúlio Vargas). The writer alagoano reports so your memories of the prison, where, along with several characters (real and fictional), representatives of most of the Brazilian society - thieves, doctors, workers, bakers, teachers, men, women, homosexuals, etc.. - Might experience physical prison. Painful experience that ended up leading him to the liberation of the spirit. A period in which he was forced to implement their own walls, breaking the bars of various prejudices that were erected in his back. Nelson Pereira dos Santos says that there is a commitment in his movie biopic with Graciliano, although the character retains the name of the writer. In an act libertarian, Nelson did not reproduce faithfully the book in his film but like Graciliano did in his book, he wrote his script memory *, a kind of memory of the memories, leaving his fiction invade that of the book. However, also the director of Barren Lives (1963) - another film based on the work of Graciliano - brought to the cinema direct style dry Grace of the Master. Did the movie with dry cuts, objectives, dour, without ruffles or technologies . Resorted to amateur actors or little known (at the time) to ensure an air of reality to the film, mixing them with other already established as the great Carlos Vereza for the lead role. Vereza indeed embody the Graciliano, managed to bring to the screen the writer's seriousness, playing fairly reliable their gestures, their attitudes, their soft-spoken and dry, her enigmatic gaze, an interpretation "almost miraculous" second counts Ricardo Ramos son of Graciliano. But get ready, the film is super long (a little more than 3 hours) and its onset is slow, hard to catch, especially for viewers today, not accustomed to staging more dramatized, more leisurely, characteristic of another era . Everything may seem so at first, artificial medium, hard, too rehearsed. But, insist, persist, do not give up. From the boat scenes the film is gaining pace, eloquence and becomes much more engaging. There are a number of interesting conversations, imprint highly revolutionary real speeches made by anonymous characters looking at the camera, communicating directly with the viewer. Touches on a documentary fiction film, moments of breaking transparency film, those purposely made to wake audiences to get them out of inertia in which they live. There are other times when we went back to pack us in fiction, we are more then touched, suffer along with the characters, root for his release. And this blend of fiction and documentary, transparency and breach of transparency, dream and standing on the ground, let accompanying memories of this great writer who was Graciliano through the eyes of this great filmmaker who is Nelson Pereira dos Santos. Certainly two men of ideas that, in periods of dictatorship, learned to use his art to pass messages libertarian. * Graciliano ended up having to leave his writings in prison, distributed among his fellow prisoners who, in an act of defense of the book, risked hiding beneath their pants and shirts leaves containing parts of their stories. A beautiful act of fellowship that so well illustrates the book and movie Memoirs of the Jail. ~ By Lilia Lustosa on September 9, 2013.